My review of Wendy Pratt's pamphlet 'Lapstrake'. Originally written for publication in Lunar Poetry, which I believe is now defunct. Please feel free to share this. ‘Lapstrake’ is a kind of planking used in the building of boats, whereby the planks ‘lap’ one over the other. A perhaps marginally more familiar term for this technique is ‘clinker-built’. The title then suggests the building of something seaworthy. We should expect craft and salt in what follows. And we get it. What is it to have lived? Wendy Pratt’s daughter, Matilda, was stillborn (a gentle euphemism), but we know, from these poems, that she lived, for they would not have been written otherwise. In some sense what this marvellous pamphlet attempts to do is to explain to its readers that paradox. Wendy Pratt’s way of making poems is to strand together myth or legend and place (element, perhaps) and person. In earlier poems, particularly in her collection Museum Pieces, earth was the place: the bones of the dead brought to life through archaeology. Here it is the sea, whence we all came originally. In her first pamphlet, Nan Hardwicke Turns into a Hare, Pratt used folk tales of the witch Nan Hardwicke to make sense of her daughter’s death. As for person, it has almost always been that daughter, Matilda, who is the chief agent. The collection begins with the title poem, which employs a sort of rhyming diluted sestina form which seems to me technically very accomplished, the rhymes and repeated words lapping over one another (perhaps Pratt has invented a new form we might call ‘lapstraking’). It acts both as a kind of declaration of poetic authority, and, in its content, sounds a cautionary note: “The world / is pouring through to Helheim” (’Helheim’ being the Viking version of Hell – Pratt is a poet of the North East). We must “nest up / as fishermen must do”, as the planks in lapstrake do. (And that word “nest” is the first note of the motherhood that sings through the collection, often, as here, and understandably, in the minor key). There follows a set of eight poems under the title ‘And Her Great Gift of Sleep’. This is a line from W.E. Henley’s ‘Margaritae Sorori’, a poem that asks that the poet be “gather'd to the quiet west, / The sundown splendid and serene, / Death.” Pratt’s sequence is chronological, a kind of diary of response to the tragedy. The first poem opens with an immediately attention-grabbing multi-image. and strange in the night sky. This could be the description of a picture, but it is not the painting that takes its title from the line preceding ‘And her great gift of sleep’, which is ‘Night with her train of stars’. 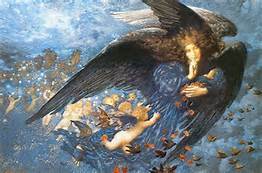 That painting, by Edward Robert Hughes, a late pre-Raphaelitish sort of painter, portrays night in the form of a blue winged angel, carrying a babe in her arms; the 'train of stars' are also babies. It crops up later in the set. This complicated image starts in the “night sky” and ends over a child’s cot, and it is impossible not to think of the preparations parents make for the arrival of their new born – the “nest”. The lines that follow violently oppose this stillness. The wind “bites like a dog in a fight”. We learn that “the sea is sick”. The sea, in just two short poems, has already become a very complicated place. We find out in the poem that follows what the consequence of that sickness of the sea is: “She is drowning”. The ocean is amniotic. is scattered with her clothes. This veers thrillingly close to sentimentality; it almost teases the reader into that safe, unthoughtful place, but preceding this is a “wet-sand-heavy” body, a “stretched belly” and a listening for the sea. The child has been taken by the water, and her memory is brought back as surely as each high tide. The dream image is earned. ‘Dover Beach’ comes to mind. The poet listens for the sound of the stones she throws into the water, “but the water / moves on and on and offers / only sea glass and fossils”. The poet, I think, is listening for the cry of her lost child, or “the underwater / tap-tap”, perhaps, of the second poem. Pratt’s poetry is full of fossils, bones, the evidence of lives lived and gone. It marks a kind of refusal to admit to history, to linear time. All those that have lived still live. The past inhabits the present: “and yesterday is tomorrow and tomorrow is today, yesterday / is now and past and future” sings a dead Minke whale in the last poem in the pamphlet. This refusal of course has added piquancy in the light of Pratt’s own experience of her daughter’s death. The tide that in a previous poem drags her “back / and forth for years” is now “the sound of the waves / coming home to the shore”. The sadness is not diminished, but there is a sense that the poet is recognizing her daughter’s self-agency, that Matilda is being allowed separation, has – and I hope this is not a morbid or offensive or sentimental idea - been born. I’ve lingered on this sequence, as I think it represents the major achievement of Lapstrake, but this is not to suggest that the rest of the poems are not rich and thematically coherent with ‘And Her Great Gift of Sleep’. The sea dominates, whether in the form of Ran – a sea goddess in Norse mythology, who lures and then cares for the drowning and drowned – or her husband Aegir, often in lapstraking poems (‘Coming Aground’, ‘Weaving’). Seagulls, mermaids, dragons, shells, sand, edges abound. By the end – the last poem, ‘Dead Whale Dreams of God’ (very Hughesian, no?) is an actual bona fide sestina – the reader will taste salt on his or her tongue and might well hear “an eternal note of sadness”.